My plane was only delayed for a few minutes at Heathrow, but I admit I checked to see if Katla had done it at the worst possible time for me (see below). Thankfully not. Anyway I picked up my hire car at Keflavik, did a few manoeuvres to re-acquaint myself with a left hand drive, then got on my way (OK I might have “changed” the driver’s door pocket a couple of times before Hveragerði, but we’ll keep that to ourselves, eh?!). 1) Bakki, where the Vestmannaeyjar (Westman Islands) ferry leaves from, has beautiful black lava beaches. 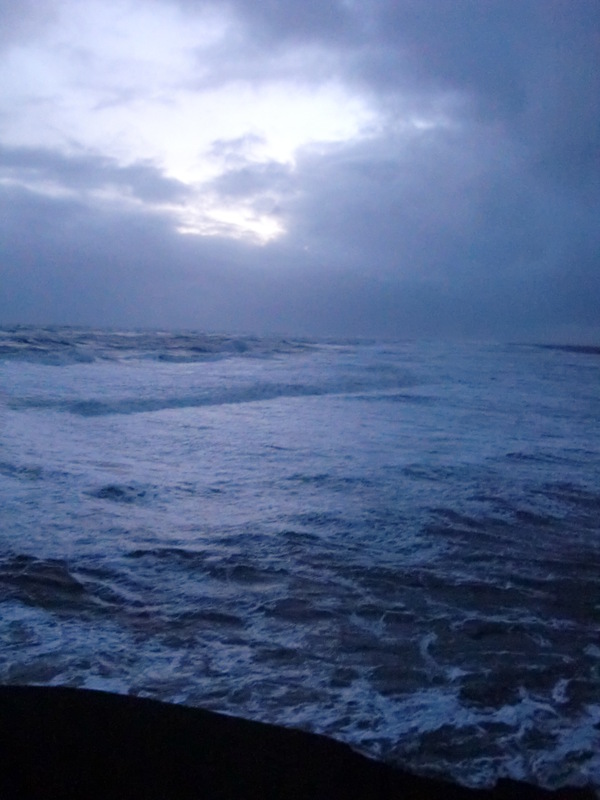 In a Force 4 gale after dark it was a true ginger kid seaside paradise! 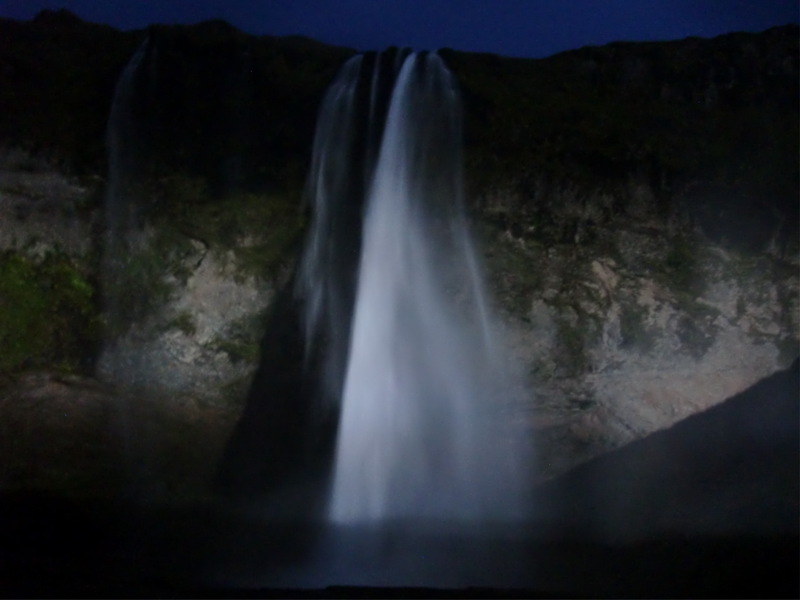 2) Seljalandsfoss, where the waterfall was heavily backlit and looked beautiful. Of course, just after I arrived a couple of the bulbs blew and it got creepy, but there you go. The stops meant I had to drive the last few miles into Vik in extreme dark (not many street lights here), heavy winds and driving rain. Fun. It was only when I parked in Vik that I discovered the handbrake in the Hyundai I3 was a little “traumatised” by a summer of American rental drivers, and could no longer hold the car’s own weight in a Force 4 gale (NB. if anyone finds the CCTV footage from the Vindbudin car park you may see me running after the car Keystone Cops-style!). 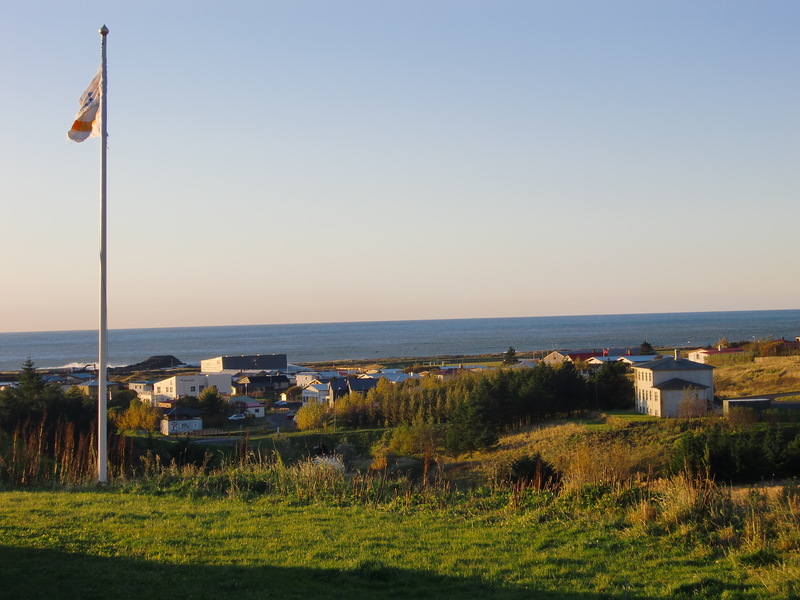 Vik is the southernmost village in Iceland, and currently preparing itself as the volcano Katla is tipped to erupt “soon” (that’s geographically soon, not necessarily next week). Home to a population of c. 300 people, on Saturday the population of Vik increased by a temporary impromptu Yorkshire convention (Elly and Jamie had found others from ‘God’s Own County’ in the HI hostel on arrival). Further excitement was provided by the local cultural festival, “headlined” by an ageing covers band providing a disco in the bar adjoining the local petrol station (and still people were going outside to smoke?!) featuring ALL of the village and, possibly, me attempting to samba dance in hiking boots. Erm… skilz! A pick-up AND an SUV? Damn, we got visitors... best start ourselves a party! This entry was posted in Iceland and tagged Bakki, ellyoracle, Heathrow, Katla, Keflavik, Selfoss, Seljalandsfoss, Vestmannaeyjar, vik by littlegingerkid. Bookmark the permalink. Hello! May I ask you how long the drive took? I’ll be doing the reverse route in January with my husband and we’d like to know how long it roughly takes. Thank you! Thanks for the comment. I repeated the Reykjavik to Vik drive two weeks ago, and it took 4 1/2 hours (with short stops at Skógafoss and Seljalandsfoss). That was with heavy snow around Vik, and the 15k closest to Vik (the steepest and most challening part of the road) being driven at crawling pace due to snow and ice. 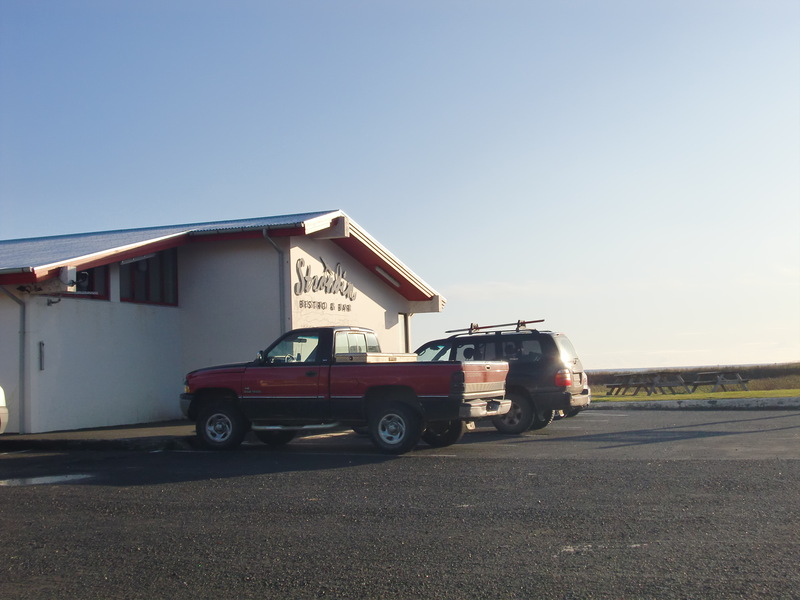 If there’s more snow in January, allow longer and try to get to Vik before nightfall.